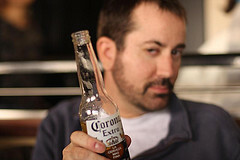 You see, later this week I’m attending TequilaCon 2009, and it’s my first TC. It’s actually my first non-Blogography-specific blogger conference, but… you knew it… Dave is an integral part of TequilaCon. So I might as well confess I’m having his baby. “having his baby” is blog-speak for “I’m doing a lot of posts involving” a specific blogger. Actually, I just made up that term, but it’s blog-speak anyway. In fact, it’s the first reference ever for this particular term used in this way! So I’m reading Dave’s recent post about Ticketmaster (warning: profanity and one-finger salutes abound) and the fact that he was planning on seeing Duran Duran while traveling. First off, this band gets a lot of flak. Often typecast or shunned / laughed at / dismissed solely because of the demographics of their once-largest-fanbase (screaming teenage girls), these chaps are incredibly talented writers, artists and performers. And to top it off, they know business. They connect with their fans (a la the VIP packages you could purchase for “meet and greets”) and continue to pump out quality trendsetting music. You shoulda seen her face light up when her phone rang with that second one. It’s one thing to have a song as a ringtone, but a custom mix? Someone nominate me for best husband, please. It’s easy to ignore the trends that D2 has set in their career. D2 has actually added a lot of “firsts” to their repertoire. They were the first to have live video cameras and videoscreens in their concerts. What concert have you gone to lately that doesn’t do that? 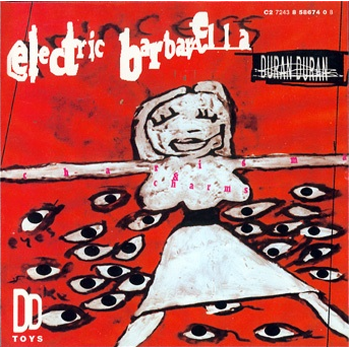 They were first artists to make a song available for digital download (Electric Barbarella in 1997). 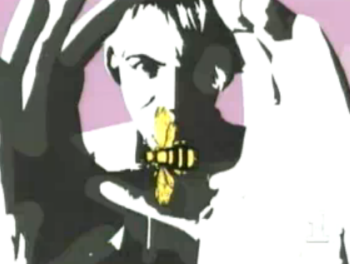 They were first band to make a pop video entirely using Macromedia Flash. 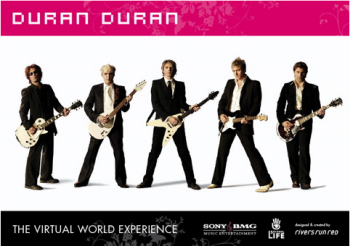 Duran Duran were the first to become citizens and stage an in-world live concert in Second Life and perform a completely virtual concert. I suspect (but aren’t sure) they were the first to do the widescreen 16:9 video format (think Hungry like the Wolf), and who knows – they may have been the first production-quality video to get banned (Girls on Film). It’s at least the first one I heard about – once again portraying brilliant marketing. For me personally, they were the first band I remember getting on my bike and ride ~3 miles to the record store to buy a 45 — their chart-topping single The Reflex. Um, Frankie Goes to Hollywood had big video screens way back in the 80’s – pre D2… yes, I was there! bubblewench – yes, they did have screens, that’s for sure (and interestingly enough, I was jamming to the 13min version of Welcome while I was writing this entry last night), but Relax didn’t even get released (and then banned, heh – how’s that for similarity) until 1983, and I honestly don’t know when Frankie started using live video with the videoscreens in concert, but D2 started that trend in 1984. Frankie’s album Welcome to the Pleasuredome wasn’t even released until late 1984. You’re keeping the baby? I’m so happy! Duran Duran has their ups and downs, but they have produced an impressive catalog of some really good music over the years. They also have an excellent reputation for the quality of their live shows, and I’m very glad to be seeing them in concert at last. Wow, Whall – you really get around! Just recently you told me you were having Adam’s baby!!! Dave, you better get a paternity test! Wait, YOU are going to TC09 too? Hrm, wonder if I can get a flight out at the last moment. I mean hey, it’s Whall! Have fun at TC. I guess I’ll have to wait until I convince you to come to Orlando in October for the Halloween party before I get to meet you. I’m a total nerd. I’ve never actually been to a concert like that and have no desire. Also, I’m not sure what tequila taste like. A whole blogging convention surrounding it? All in all, I misc the stuff I don’t want to misc. 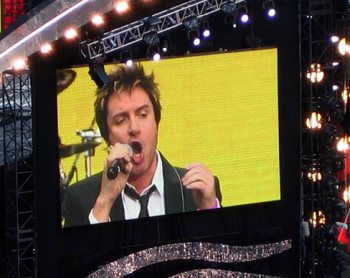 If… I mean, WHEN I rule the world, trash talking about Duran Duran will be a capital offense. Everyone will be required to kneel when Rio is played. Hungry Like the Wolf will signify the commencement of a Holy War. 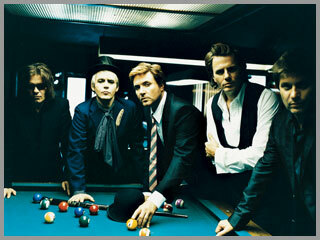 All individuals will be required to pledge their allegiance to the United States of Le Bon. It will be no Ordinary World. Penelope´s last blog post..One thing after another. BlondeBlogger´s last blog post..20 Years! Dude – I NEED those ringtones! Can you hook a gal up? Please??? Stephanie – Sure, you can have them. Here are the mp3’s: http://whall.org/blog/audio/sms.mp3 and http://whall.org/blog/audio/duran3.mp3 – if you need help loading them on the phone, let me know. I might be able to help. If you need a different format, I can do that too, although if you search here you can see that I already have them as mp3 and wav files. I think. Ha, I do need help loading them onto my phone – can you email me the directions? THANKS SO MUCH! You rock! Figured it out – nevermind! THANKS AGAIN!!! Can I please please have the second ring tone now????? YES, I’d say that the ringtones qualify you for a top husband award. I fully intend to steal #2….thank you! Soooo, how long have you and Dave been married? 🙂 I mean, SURELY, you would not be having his child out of wedlock….. I somehow managed to miss this post (and I was reading your blog in 2009, too). D2 ringtones made just for you two. I’ve always referred to D2 as the “Fab Five” I’ve only seen them live once (with Warren Cuccurullo during the Notorious tour), but would love to see at least 4 of the 5 original members live someday.